Norman Doidge, M.D., is a psychiatrist and psychoanalyst. He is on the research faculty at Columbia University’s Center for Psychoanalytic Training and Research in New York City and on the faculty of the University of Toronto’s department of psychiatry. His last book, The Brain that Changes Itself, was a New York Times bestseller with more than a million copies sold. He lives in Toronto. “Stunning . . . 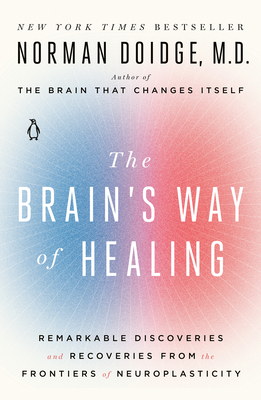 The Brain’s Way of Healing is another groundbreaking book by Norman Doidge. “The Brain’s way of Healing is a stunner—the sort of book you want to read several times, not because it is difficult to understand, but because it opens up so many novel and startling avenues into our potential to heal. Norman Doidge enthralls us with a rich combination of lucidly explained brain research and pioneering new (and some not so new, but not widely known) approaches to recovery. With an eloquence reminiscent of Oliver Sacks, Doidge bolsters the latest advances in brain science with a series of extraordinary case histories of people for whom all hope seemed to be lost, but who healed as a result of great personal courage, and by changing the ways their bodies and brains processed sensations and movement. This hopeful book demonstrates that a variety of sensory inputs—light, sound, electricity, vibration, movement, and thought—can awaken the brain’s attention processors, and thereby allow even the most afflicted to (re)gain ownership of their lives.